Gaius Baltar tortured/in imagination (merged pics), Battlestar Galactica, October 6, 2012. Qualifies as fair use under US Copyright laws – low res (1st picture) and merged rendering. “A wide receiver tiptoeing the sideline of a football field after making an acrobatic catch, barely keeping his left foot in-bounds by tapping his big toe in the two inches of space between the grass and the thick white line in front of him. A note in a song that is so inspiring, so well-balanced between rhythm and harmony, so well sung that the hairs on my neck stand up and my spirit feels like soaring.” This is what I wrote in the first paragraph of the preface (which I need to revise yet again, by the way) to my Boy @ The Window manuscript. In context, I was writing about the infinitesimal decisions and actions that could’ve added up to success or failure for me growing up in those dismal days and years. But I could’ve just as easily been writing about what imaginations and fantasies went through my head growing up to make my inner world more powerful than anything I saw and experienced in the real world. Much of Boy @ The Window is about how I coped, good, bad and ugly (see my posts “Peanuts Land” from April ’12 and “Mr. Mister’s ‘Kyrie’” from March ’11 for more). How I coped through imagination, inner projection and fantasy changed during the worst of my preteen and post-puberty years. I went from imagining and acting out an entire city, nation-state and culture in my room to the need for an internal world that couldn’t be taken apart by abuse, poverty and isolation. Ultimately it came for me in the form of the everyday things I either already liked or was on the cusp of liking. I already enjoyed a wide variety of music by the fall of ’82. Once I became a sports fan and occasional sports participant, those images and achievements became part of my inner movie and soundtrack. It became a partnership that I eventually learned to conjure up at will, that became part of my residual sleeping state, that made the madness of 616, MVHS and Mount Vernon, New York dissolve into background noise. Santonio Holmes’ Super Bowl XLIII game-winning catch, Tampa, FL, February 1, 2009. (http://bleacherreport.com). It meant, though, that watching a Mets, Giants or Knicks game or listening to Earth, Wind & Fire wasn’t a simple casual experience. It involved rooting for the underdog, which in turn meant rooting for myself. It included the synching of home runs, touchdown passes and three-pointers to guitar riffs, crescendos and other highlights in a particular song or series of songs. It meant that my imagination became itself a fully dedicated line for coping with stress, checking anger, solving problems, and seeing my world the way I chose to see it, rather than the way my world actually was. Take one of my favorite songs as a teenager, Yes’ “Owner Of A Lonely Heart” (1983). It wasn’t just the fact that I actually felt lonely and could relate to the song. When I heard the song, I could see myself running a screen play in football, following a group of well set-up blockers all the way to the end zone for a touchdown. I could relate emotionally, because the song was about me as an underdog, because of my unrequited love for Crush #1, because I now knew what a screen pass was. It made existential philosophy easier for me to understand my senior year of high school in my AP English and Philosophy classes. “Owner Of A Lonely Heart” also reminded me to never “concede my free will,” even when my now ex-stepfather Maurice’s fists met my face and teeth and ribs at fifteen and sixteen. Like a scene from the ’00s Battlestar Galactica involving Gaius Baltar or Caprica Six, I often projected a view of the world I wanted over whatever was going on in reality. Going the mile or so between 616 and the C-Town in Pelham could either be a chance for me to catch a long touchdown pass or for me to figure out to which colleges I should apply. 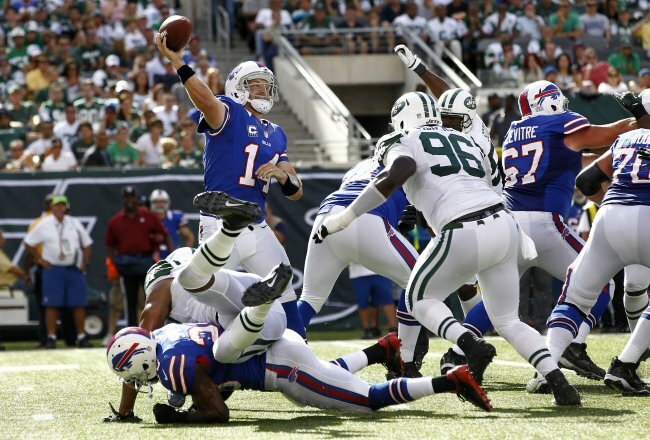 Ryan Fitzpatrick of Buffalo Bills v. NY Jets, in rare protection against blitz while in pocket, October 6, 2012. (http://bleacherreport.com). Sometimes, if I allowed myself to slip deeply enough, like, in the moments before an exam, I could use a buildup point in the song to bring in an extra blocking tight end to run a max-protect play. I’d snap the ball, send three receivers on one side of the defense, and wait just long enough for one to cross before delivering a perfect pass that allowed my receiver to split the secondary for a long score. All while taking a hit in my right ribs and being knocked down to the turf, just a quarter-second after my index finger’s come off the ball, giving it a smoother spiral rotation while in flight. And so many times, that re-visioning of my world made it so that my natural ability to remember everything and discern many things resulted in very good grades, solid performances, and a balancing act that made life at 616 and MVHS just bearable enough. I was reminded of how often my mind went down this road by Touré’s Who’s Afraid of Post-Blackness (which I blogged about earlier this week), particularly his chapter on imagination and art, “Keep It Real Is a Prison.” Except that my mind does still go there sometimes. Usually as I’m about to give a speech, or while running a five-miler, drilling a three or driving. Or in writing something for publication, like Boy @ The Window.